Contributing editor Christina Ohly has been traveling to London with her kids since they were infants. She knows how to mix parent- and kid-approved museums, shops, restaurants, and hotels. LONDON – London is one of the — if not the best — cities to visit with kids. Here are highlights for all ages, palates, and interests, with South London as a base for exploring central London and the outskirts. Gone are the days of exploring the Elgin Marbles at a leisurely pace, so don't even pretend. Keep your museum visits real by starting in South Kensington at the incomparable , which is full of interactive exhibits, steam turbines, space capsules, and the most imaginative water play area ever. Next, head down the block to the , an architectural marvel in and of itself. Children will never tire of the dinosaurs, and the endless diamonds are a nice diversion for grown-ups. Refuel nearby at , where udon noodles, soups, and the requisite "chicken tenders" are served at festive communal tables in a light, airy setting. After a little sustenance, go into and follow signs to the . 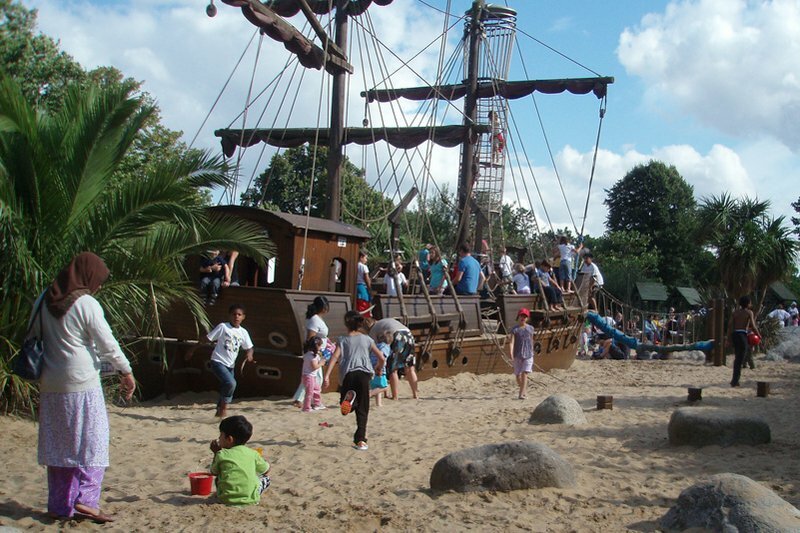 The enclosed area is great for kids of all ages, with everything from baby swings to a massive pirate ship with rope ladders and secret hiding places. Cool off with a soft-serve cone within the playground before exploring the rest of heavenly by bicycle or on foot. (The English really do excel at public gardens.) Swans, geese, and ducks provide entertainment, and you can rent old-timey lawn chairs for the balance of the afternoon. If energy/attention spans allow, pop into the mid park for a quick shot of contemporary art in a classical setting. Sometimes with kids you just need to go with it. in nearby Windsor is one such example. Your kids will love you and they will be re-energinized for all the cultural events you'll throw at them for the rest of your journey. The incredibly fun park is a hit with ages 3+, and, at just 40 minutes from London, you can pack quite a few rides, sweet treats, and general amusement into a half-day. Once back in the city center, head to the for its rich history of beefeaters, guillotines, dark prisons, and the Crown Jewels. It gets crowded, so visit at off-peak to avoid the masses and . From here, you're across the river from the Embankment and the and the museums. Depending on the show, I've found the Modern, which is housed in an enormous former factory, is more kid-centric. The sheer spaces, enormous escalators, and colorful art installations will captivate virtually everyone, and a snack overlooking the river in the ground floor cafe is a . No trip would be complete without a visit to the sprawling toy shop spread across an entire floor at . You'll find everything from Union Jack memorabilia to Barbies to wooden building blocks. Spend the rest of the day soaking in local, small neighborhood color: the bakeries, the butcher, the "ironmonger" (aka the hardware store). Have a light supper at , where kids delight in picking tapas-style sushi plates from a conveyor belt: chicken teriyaki skewers, sashimi, white chocolate mousse and berries. The techno-vibe makes for the perfect mix of food and theater. I am no fan of central London hotels with kids (unless you're living large and want to load it up at ). I prefer one of these quiet, kid-friendly establishments with green spaces and green grocers nearby. - Slightly mod, low-key, and absolutely well-placed near Chelsea Green. - It overlooks Kensington Palace and Gardens which makes it perfect for families - and anyone in search of green space. The incomparably cool Princess Diana playground is just steps away, and the hotel's newly redone Natura Bisse spa makes for a Zen escape at day's end. Spacious suites and Italian warmth and hospitality are all es. - Hyde Park is your backyard when staying in one of the spacious suites and quirky, chintz-filled apartments on on Kensington High Street. It works well for families and the Stables Bar, a cozy clubhouse restaurant straight out of a Ralph Lauren ad, serves excellent Wagyu burgers with buckets of crispy fries. - It has a rooftop pool. Enough said. And it's near Hyde Park, Harrods, and Yo Sushi! at the top of Harvey Nichols. - This one has family rooms — a rarity in the UK and Europe — where four can fit semi-comfortably. Well-situated to Peter Jones (department store where you'll inevitably end up after having forgotten some key piece of equipment) and the King's Road. Proximity to the Duke of Yorks Square is a . Check out the London Guide for more hotels, restaurants, shops, and itineraries. Photos, from top: courtesy of ; courtesy of ; / Flickr; courtesy of .